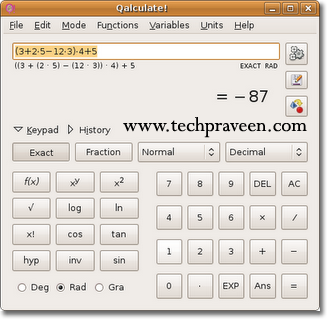 Qalculate is a multi-purpose desktop calculator for GNU/Linux. Qalculate is extermely small and simple to use but with much power and versatility underneath. Features include customizable functions, units, arbitrary precision, plotting, and a user-friendly interface (KDE or GTK+). The options on Qalculate in Linux just blows the Windows calculator away. Imagine a calculator where you can solve extremely complicated expressions, or just convert between different measurements, and you’ve got Qalculate. 1. Goto Applications -> Accessories -> Terminal. 3. Then the installation process will start. I've been using it for the past 2 years…. The other day a job partner that uses windows stood still when i made in front of him a calculation using several units before converting all number to the same units….